Open to the public as well as Southern Graphics Council Conference goers and exhibitors. 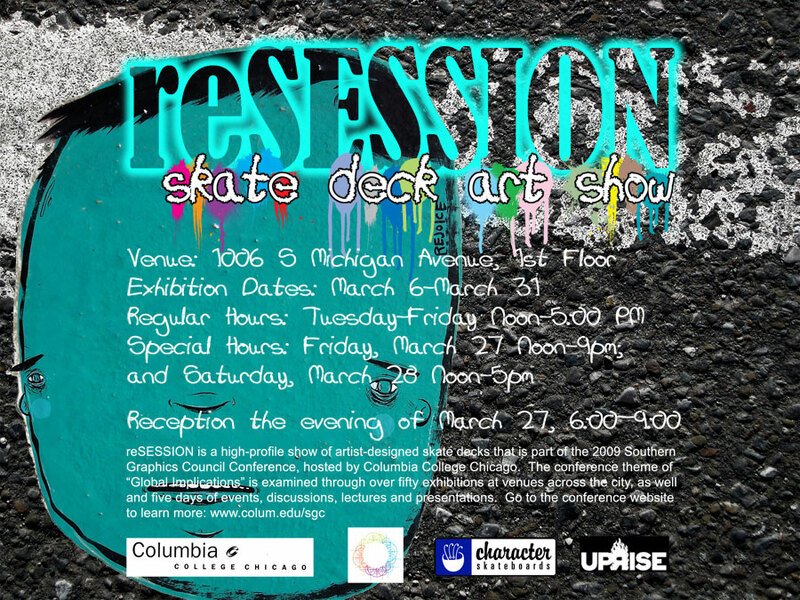 reSESSION will be a high-profile show of artist-designed skate decks exhibited in conjunction with the 2009 Southern Graphics Council Conference, hosted by Anchor Graphics at Columbia College Chicago. Over one thousand conference-goers will examine the theme of “Global Implications” through exhibitions at almost fifty venues in and around Chicago and four days of events, discussions and presentations. 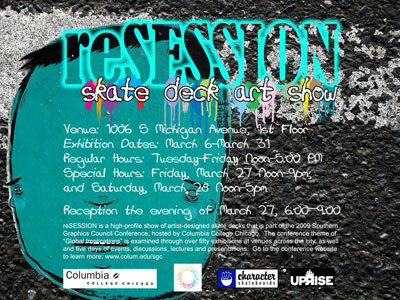 reSESSION will be held at Columbia College in the highly-visible, street-level gallery of the 1006 South Michigan Building. reSESSION will be shown alongside work by artists from around the world, including: the International Print Center New York’s New Prints: Winter exhibition; Contemporary Prints from Australia; and an international exhibition of artists’ books. Artists contributing to reSESSION are encouraged to utilize printmaking processes in the creation of their boards. These boards may include silkscreen and relief printing, transfer processes, and stencil processes in addition to hand-applied marks. The Southern Graphics Council is the largest professional organization of printmakers in the universe, with members from across the USA and Canada, as well as South and Central America, Africa, Asia, Europe and Australia. Anchor Graphics @ Columbia College Chicago is a not-for-profit fine art print shop that brings together, under professional guidance, a diverse community of youth, emerging and established artists, and the public to advance the fine art of printmaking by integrating education with the creation of prints. Since 1990 Anchor Graphics has taught over 1,000 Chicago area high school students with free in-depth printmaking classes.